A HubSpot Platinum Partner providing you with integrated and comprehensive inbound marketing solutions. As a HubSpot Platinum Agency Partner, we help our clients achieve marketing success through a combination of inbound marketing best practices and HubSpot expertise to deliver world-class results. Prism Global Marketing Solutions has received several industry awards and HubSpot Impact Awards for providing unique and innovative inbound marketing services to our clients. "The Prism team have been excellent guides to our journey in utilizing HubSpot to its full potential for our inbound programs and campaigns, helping to connect with our customer community faster, at a deeper level of engagement and with more effective analytics that allow us to continually improve our program." Discover how you can dramatically improve your email marketing performance utilizing send time optimization to get your message in front of the right audience at the exact right time. 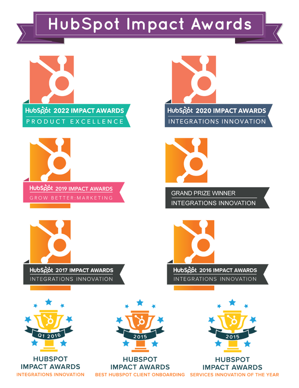 This case study won the HubSpot Impact Award for Integrations Innovation. Prism Global Marketing Solutions has set an example for how businesses everywhere should be transforming their marketing with inbound. Their strategic approach to attracting, engaging, and delighting customers has not only built valuable relationships with their audience, but has also driven growth for the inbound movement. Discover how you can maximize your inbound marketing and inbound sales efforts! Get the latest inbound best practices and tips from the experts with marketing tools including e-books, whitepapers, and more! Visit the Resource Center. Visualize the impact of inbound marketing and sales on your organization's bottom line. You can also download the results immediately to share with your team.